The Costa del Sol in southern Spain is the centre of vitality and melting pot of many cultures. The sun coast with miles of beaches bears her name in all honors, with more than 320 cloudless days a year. 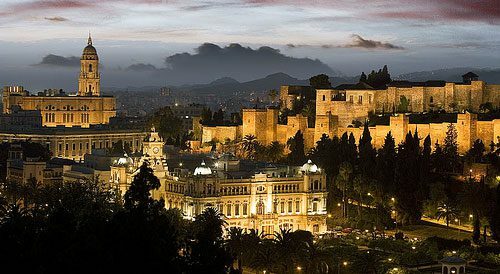 Málaga, capital of the Costa del Sol is one of the oldest cities in Europe. Today Malaga is a lively port, commercial and university city, which is worth a visit any time of the year. As in other coastal sites in the region of Andalusia, the climate is temperate, with an average of 30 degrees during the summer and 18 degrees Celsius during the winter, as the mountains protect the coast from cold north winds. The people are friendly, besides enjoying a wonderful climate which is ideal for a stroll along the old walls of the palace Alcabaza with its beautiful gardens by the sea and decorated with palm trees, orange trees and jacaranda. The Alcazaba is a fortress built in the eleventh century by the Muslims who ruled at that time in Malaga. The fortress is located on a hill and from there you can enjoy a wonderful view over the city. There are gardens to admire along with fascinating architecture, all of course under the influence of the previous rulers and their culture. Tourists can also visit the birthplace of Picasso or the lively Plaza de la Merced and enjoy the city views from atop the castle Gibralfaro. Stroll through the Old Town and along the harbor and the city park. Try the tapas bars in Malaga’s bustling districts, enjoy an espresso in a square next to the Cathedral. With the expansion of Malaga airport, the region now has one of the most modern airports in Europe with a huge range of destinations. Malaga airport is well connected by modern roads. This makes Malaga an excellent destination if you visit this region of Spain. Along the coast are running the highway and coastal road and you can easily reach in your rental car destinations such as Torremolinos, Fuengirola, Marbella, Granada or Gibraltar. It’s worth a drive along the old coastal road, on which you can enjoy beautiful views and explore new beaches and locations, which may invite to stay.